Building a family and watching your children grow can be one of the most rewarding experiences. For Jonette Owens, her role as a Driver Recruiter has had a similar influence on her life. Her family values run deep and extend into TransAm. However, it does not end there. “Watching the drivers that I recruited many years ago grow to be successful is gratifying”, said Jonette. Jonette has had many drivers win awards and complete astonishing achievements, such as Elwin Hines, Sr. and Bruce Bento. While her drivers may not be her kin, Jonette believes that these relationships are special. She stays in touch with many of her drivers and always wants to find out how they are doing. “Jonette is a great asset to TransAm and the recruiting team. 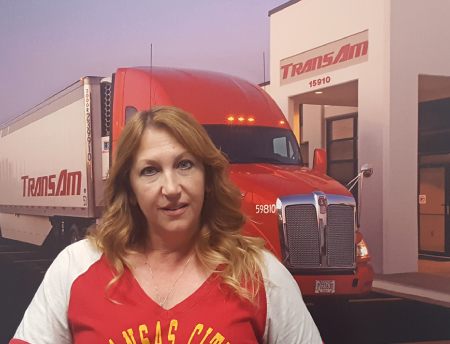 Her success comes from her dedication to TransAm and the passion she has for her job.” said Shawna Simpson, Manager of Driver Recruiting. The comparison between recruiting new drivers and raising a family may seem like a stretch, but it’s not. Watching those around you be successful and knowing that you had a part in that success is a great feeling. Without Jonette, TransAm would not be the company that it is today. Her kindheartedness towards others brings the family aspect to the TransAm company culture. We are grateful to have Jonette and the value she brings to the team. Thank you, Jonette, for everything you do!